Every week, The Daily’s Music Beat comes together to make the Tree-Mix, a playlist of the music that’s been on our minds. This past week’s theme focuses on songs of the summer, a season that, despite this week’s weather, was an entire month ago. The vast span of time elapsed since those days of September, so dearly gone away, deserves some nostalgia, doesn’t it? Carly Rae Jepsen — “Cut To The Feeling”: Explaining Carly Rae Jepsen is maddening in its impossibility. I can list the wonderful things that “Cut To The Feeling” does, from how the opening, Madonna-biting synth glissandos draw you in immediately, to how the handclaps and rhythm guitar keep the tension high during the verses to allow for the supreme release of the chorus, all synth sustains and vocal joy. I can’t quite explain, though, the sum of the parts here — “Cut To The Feeling,” like all of CRJ’s best songs, is an experience beyond just the song, an artificial pop confection that manages to convince you of its authenticity by sheer joy. It’s summer, or at least the parts of summer that we selectively remember, distilled into slightly more than 200 masterful seconds, an instantly compelling shard of pure energy. 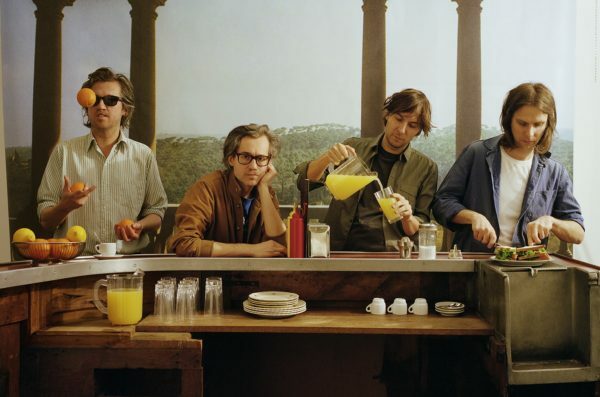 Phoenix – “J-Boy”: Phoenix’s new album “Ti Amo,” released in early June, was a little too saccharine and superficial to really merit serious critical scrutiny. Former Music Desk Editor Tyler Dunston, my roommate at Oxford at the time, and I felt jaded enough towards their French Riviera sellout-chic aesthetic that we started compiling a list of made-up Phoenix tracks, with titles like “Cotton Candy,” “Prosecco” and “Santorini.” Somehow, the opening track of the album – with its deep synth opening followed by a single falling note, over-the-top drums, and hysterical vocals – still lodged so firmly in my head that I played it on stereos all over Europe, from a loft off the Boulevard Raspail in Paris to an English bed-and-breakfast near Hadrian’s Wall, until my traveling companion begged me to find something else to listen to. Bomba Estéreo – “Amanecer”: This summer was a pretty great time for music discovery. I had a hard time narrowing down my favorites of the season (which are well represented on the rest of this playlist) but decided to go with a song by Bomba Estéreo, a Colombian band that specializes in cumbia-inspired alternative dance music. If that description doesn’t scream “summertime party vibes,” I don’t know what does. “Amanecer” is the perfect song to dance to with friends, or play while you’re getting ready for a night out. Lead singer Liliana Saumet’s rapping is slick, while her singing on the chorus sounds like she’s doing it with all her might. I was lucky enough to see Bomba Estéreo live at Outside Lands music festival in August, and their performance was surprisingly one of the highlights of my weekend. They turned the Panhandle stage into a nightclub and energized the freezing festival attendees on that foggy night. If you’re looking for fun Spanish-language music, but mainstream hits like “Despacito” aren’t really doing it for you, I’d highly recommend giving Bomba Estéreo a listen. Kishi Bashi —“Honeybody”: Indie pop violinist Kishi Bashi released his third album “Sonderlust” in September 2016; winter and spring came and went and found me still listening. “Honeybody,” the final track, is many things at once: electric, orchestral and rhythmic, a love song, ode to board games and possible product placement. It’s the perfect example of what makes his music so great, an intricately layered pop song that can be listened to over and over and that feels musically erudite without taking itself seriously. When Ishibashi goes for the chorus in his glossy falsetto, “Ooo-oo-oo-oo-oo-oo-o, Honeybody want your body,” it sounds almost like a parody, but all the same it’s the enjoyable sound of a talented musician having fun, pop music like nothing else out there. Tyler, The Creator – “911 / Mr. Lonely”: When Tyler, The Creator dropped the gory music video for his lead single “Who Dat Boy,” it seemed as if he had just released more of his signature aggressive, horrorcore influenced hip hop. As “Who Dat Boy” closed out with an engine rev, the video jumps to multiple copies of Tyler crooning “Call me, call me, call me,” all their vocals coalescing in a unified plea when Tyler tells us his number, “911.” The video cuts abruptly. These final 30 seconds were unlike anything I had ever heard from Tyler. They evoked a sunny sense of desperation, a smile turned sour with too much time under the sun. Further Spotify research taught me that this snippet came from the B-side of “Who Dat Boy,” formally known as “911 / Mr. Lonely.” The two parts of this song are inexplicably linked melodically and thematically, evoking a sense of loneliness within a crowd when summer days just get too lazy. “911” is easily the brighter of the two halves, featuring a desperate Tyler and a Steve Lacy-led chorus repeatedly asking you to “call [him] sometime.” With chirps from Frank Ocean, “911” almost seems to answer Tyler’s pleas. However, when the song makes the call for you, the number is busy. The song changes gears. As we enter “Mr. Lonely,” Tyler grapples with letting go of his hope of companionship and turns to his material possessions for comfort. Tyler is just authentically sad. No gimmick. No “psyche!” He truly believes that he should blame himself for his lack of true friends. Ending on a foreboding note, Tyler hopes for someone to genuinely ask him how he’s doing, or else he’ll have to call 911, a number doubling for himself and the actual authorities. While “911 / Mr. Lonely” directly deals with Tyler’s loneliness despite his fame, this song’s consistent shifting of emotional lanes doubles as a reflection on the dark underbelly of the stereotypically bright days of summer. Fleet Foxes – “Third of May / Ōdaigahara”: On June 16, Fleet Foxes returned — finally — with their third album, “Crack-Up.” On June 18, I was sitting in the sweltering heat of Stanford Stadium, ready to leave for the summer. My senior year was marred by political and personal devastation. I’d lost my sense of focus and my sense of purpose. I’d grown insecure about my relationships, sometimes feeling like I was the only one invested in them and other times feeling like I wasn’t doing enough to maintain them. On June 19, I was back home with a diploma and a mess of unanswered questions: Where did my best self go? What do I mean to people? Was I too slow? Did I change overnight? Those last two questions are sung by Robin Pecknold on “Third of May / Ōdaigahara,” the lead single and beating heart of “Crack-Up.” I still don’t have the answers to those questions. I still wake up some afternoons and wonder when I’ll see my best self again. I still look at an unanswered text and wonder if its recipient cares as much about me as I do about them. All of this is to say, there are few lonelier places to be than lost inside your own head, and few heavier realizations than that you are the source of your own torment. “To be held within one’s self is deathlike.” I know. Queens of the Stone Age – “The Way You Used To Do”: If grunge rock or any sort of groovy distorted guitar is your jam, then I highly recommend that you check out Queens of the Stone Age’s newest album, released in the summer: “Villains.” The new songs take a trip from the band’s previous signature sound, driven by crisp edgy bass guitar, and instead take up a retro-electro-swing sound. “The Way You Used To Do” is the lead single of “Villains” and finds its beat in a fast, borderline stressful riff played on a guitar with the bottom string intentionally snapped off. Many songs have the ability to flip your mood entirely, making you feel happy, excited or dreamy; this song is no different, and I assure you that after listening to “Villains,” you will be out to conquer the world. Good luck!